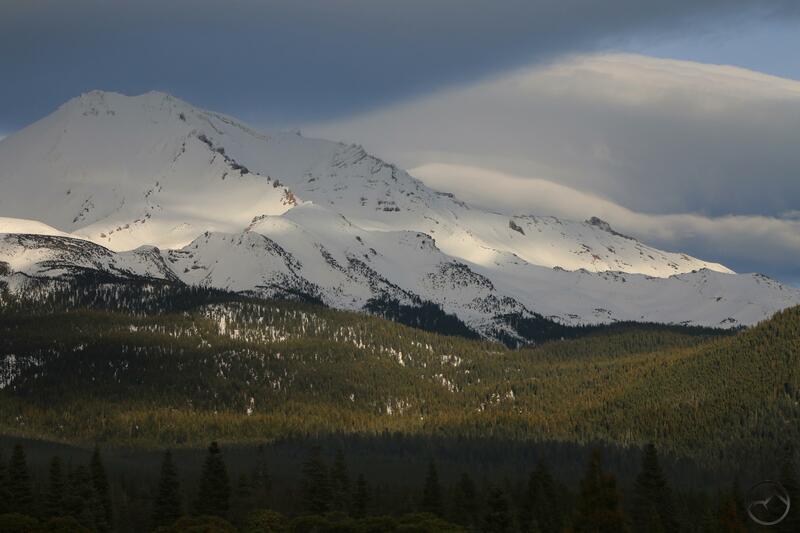 Turbulent clouds surround Mount Shasta. 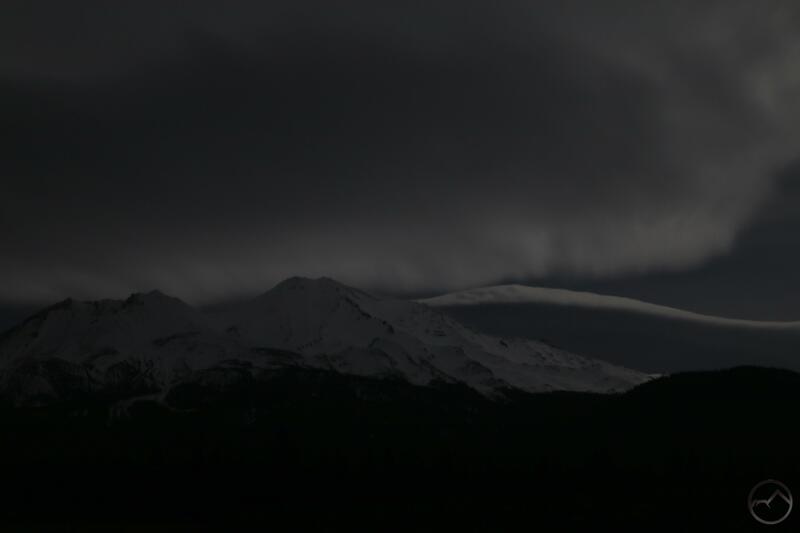 Yesterday, as I drove to the City Park to attend the Gateway Trail meeting, Mount Shasta was beset by an array of unusual clouds. As best I could tell, most of them, though peculiar in shape and apparent consistency, were not lenticular clouds. One cloud, hovering above the southeast corner of the mountain did seem to have the classic lens shape, but did not have the distinct lines of a lenticular cloud. Nonetheless, the display in the heavens was too good to pass up and, though the meeting was set to begin soon, I could not resist stopping and taking several images. The clouds above Mount Shasta were not the only ones in the sky. To the west, a great deal of meteorological activity was evident above the Trinity Divide. The result of all these clouds was the constant and swift fluctuation of light conditions on the mountain. Bands of trees would be light while patches of snowy flanks glowed brightly, only to have all quickly shrouded in dark, muddled light. 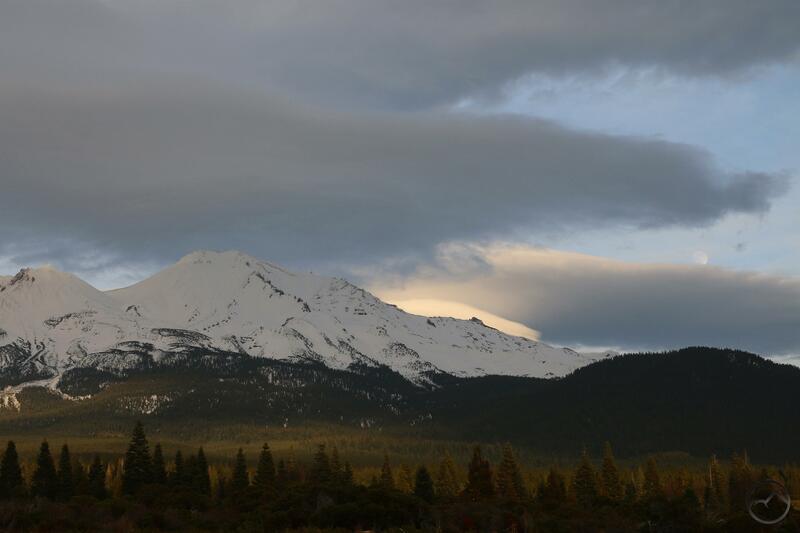 The sun would then reposition yet again, the clouds would change, and then new strands of light would appear on Mount Shasta. It was a grand spectacle and one thoroughly enjoyed by yours truly. With the meeting set to start in only a few minutes I began to pack my camera up. Then, unexpectedly, the moon began to rise above the clouds sitting on the horizon. I had not anticipated this welcome guest but was quite glad to see it. I repositioned my camera and began shooting images again, resigned to the fact that I would be a couple of minutes lake to the Gateway Trail meeting. The moon peeks out from behind a “lenticulish” cloud. As the moon rose, it entered a clearing in the clouds and seemed to hang there for an extended period of time. 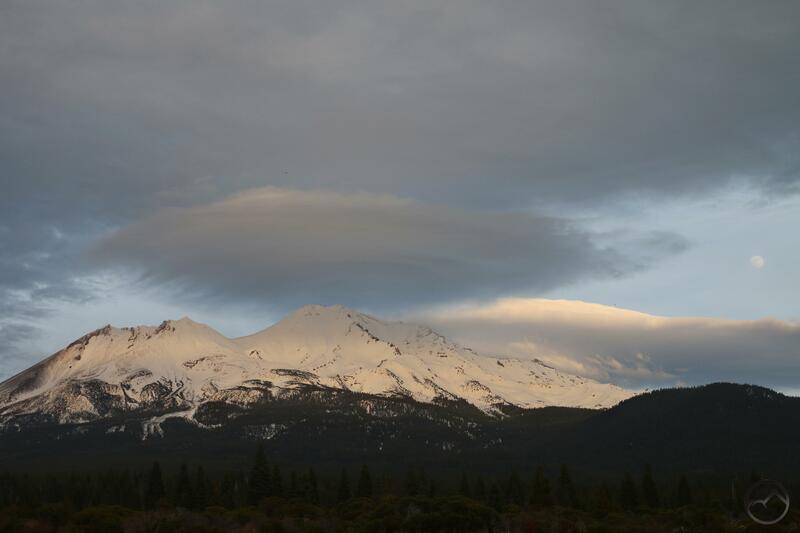 While this was going on, the heretofore amorphous cloud directly atop Mount Shasta began to coalesce into a more distinct shape and began to take on attributes of a lenticular cloud. Now late, I could not resist sticking around for a few more pictures. After being the battleground between light and shadow up to this point, the light gained the upper hand and the mountain was wholly blanketed in the fading sunlight for the first time. It was a spectacular sight! 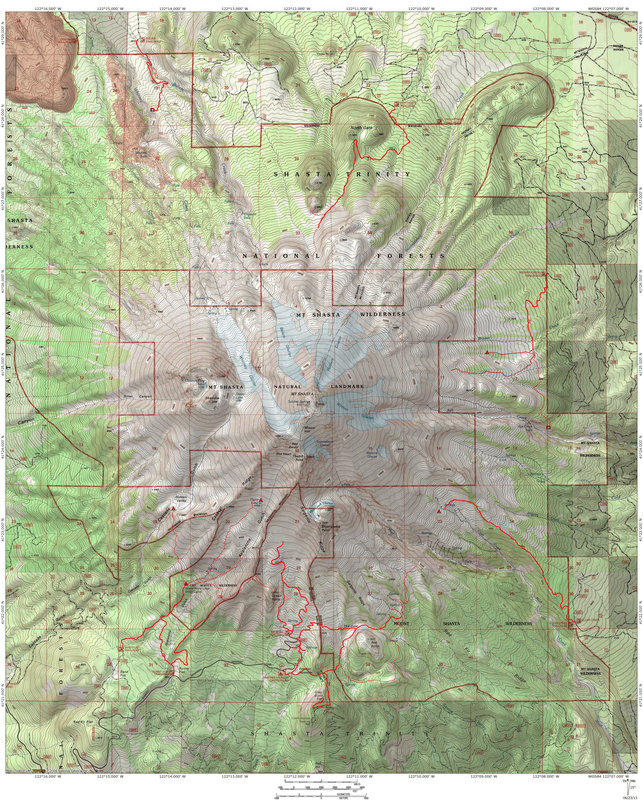 I think it’s the Spiritual brethren mountain visiting the physical mountain.